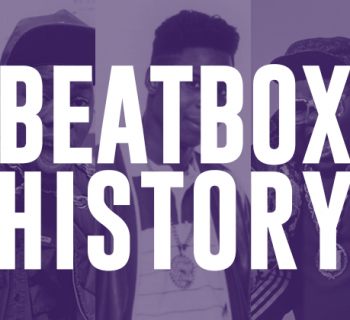 As a quintessential part of hip-hop culture, battling is one of the most distinctive and important platforms for beatboxing. Rules and regulations may be varied, but beatboxers are required to either battle against face-to-face with each other or showcase to a crowd within limited period of time. 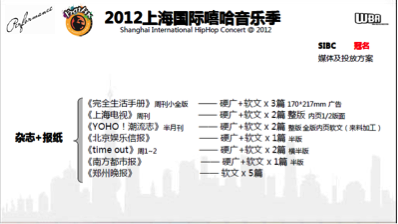 Performances of beatboxers will be judged by three to seven judges against criteria that include originality, technicality, musicality and crowd response. 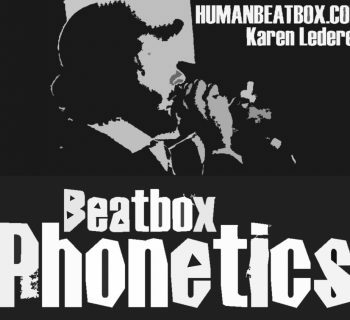 Since the first national beatbox battle in the world (1st German Beatbox Battle) took place in Berlin, 19 September, in the year of 2002, as well as the first international beatbox battle (1st Beatbox Battle World Championship) in Leipzig, Germany in 2005, national and international beatbox battles have been organized all over the world. 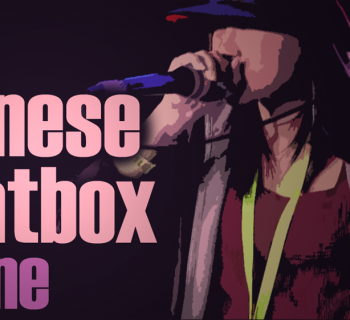 The first beatbox battle ever in China was held in Yanbian, Yanji, Jilin Province in 2006 , and it was a non-profit event without any sponsors. 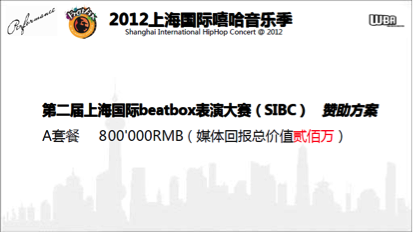 However, on 14th November, 2009, the first national beatbox battle held in Shanghai under the title of Shanghai International Beatbox Competition (SIBC) was the first and largest profitable beatbox battle. 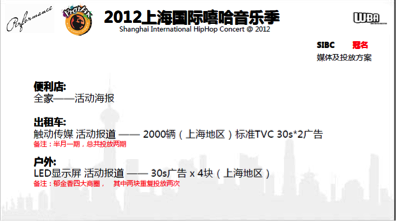 With tickets selling at 3 different prices (RMB) - 200, 300 and 500, and with 17 sponsors including China Radio International (CRI), International Channel Shanghai (ICS), Youku, PPLive, Buynow, etc. SIBC turned out to be successful both artistically and financially. 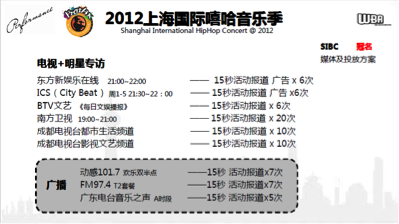 It not only ended up as an eye-opener for many Chinese people, but gave contestants in the game extra commercial value as they work in the entertainment business (shangyan). 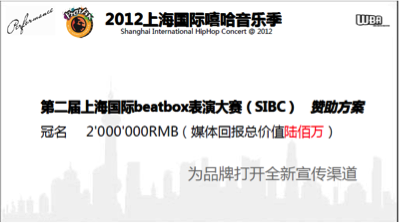 However, the 2nd Shanghai International Beatbox Competition, authorized by the UK-based World Beatbox Association, ended up as a scandal as the organizer failed to pay the winners and judges. 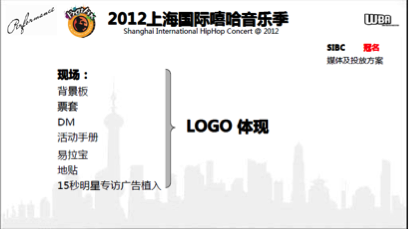 Hosted by China Shanghai International Arts Festival Centre and promoted by Shanghai Bofeng Advertisement Company (上海帛丰广告有限公司), the event was planned with a clear and ambitious commercial goal, as part of the Shanghai International Hip-hop Concert 2012 (SIHC, 2012上海国际嘻哈音乐季). 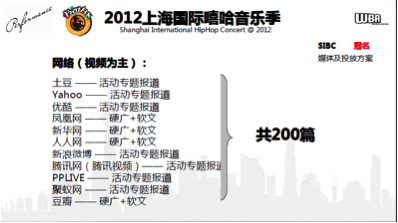 However, the organizer did not manage to obtain any sponsorship as they claimed in an official announcement, and failed to pay the winners and judges until now. However, in Foshan, Guangdong Province, beatbox battles have turned out to be a sustainable and profitable business. 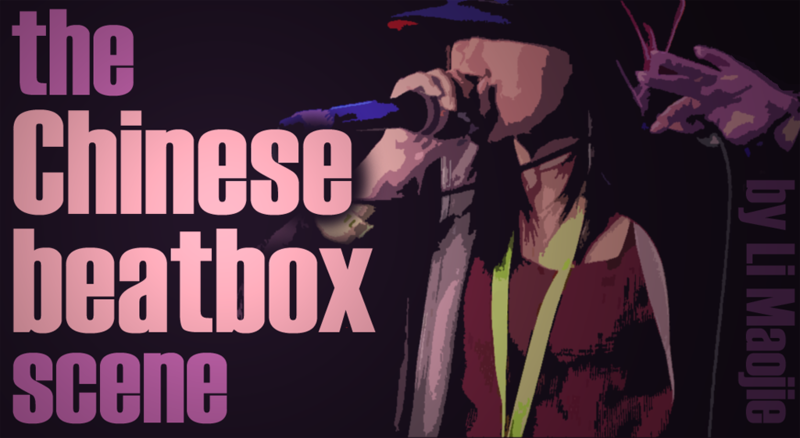 Kong Siwei (孔斯维), president of Foshan Street Culture Association, has been running beatbox battles since 2012 with high publicity and support. 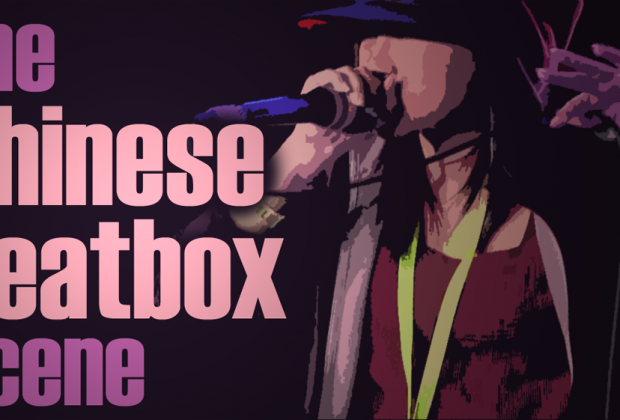 Started as a local beatbox competition, Foshan Street Culture Association has organized multiple Guangdong provincial battles and, in 2013, had it franchised to 6 other provinces - Hunan, Yunan, Anhui, Zhejiang, Hebei and Xinjiang. 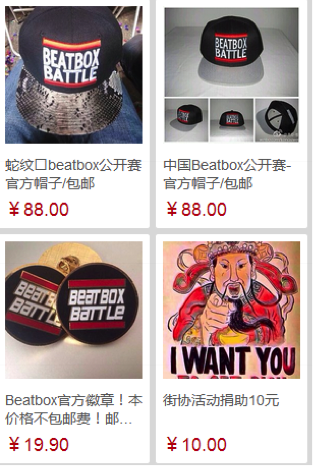 Besides sponsorship, Kong also sells beatboxing related products such as clothing, tags and wristbands. 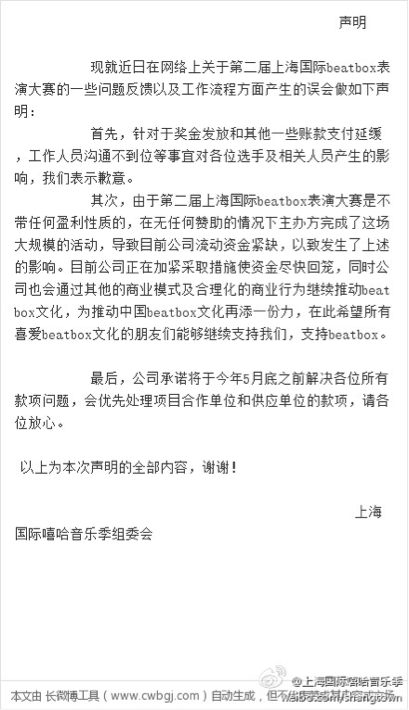 Through the wide influence of his serial beatbox battles, Kong has attracted attention from beatboxers across the country, and he has promoted the battle scene to mature as a viable business model.